Welcome to a couple of firsts for my blog: this is both the first time I’ve participated in a blogathon and also the first time I’ve tried to write about the career of a specific filmmaker, rather than examining their films one at a time in capsulized reviews. Perhaps even more exciting: this post falls on my blog-birthday: The Century Film Project has now been in the blogosphere for exactly 1% of a century! When I heard about the “Russia in Classic Film” blogathon being held by Movies Silently, I knew I wanted to see what I could come up with on Evgeni Bauer. * I had only just discovered him, and have since written three reviews of his films, but I knew I had found someone special. His movies are so advanced by the standards of the teens that it’s hard to believe they aren’t ten years later than the dates they show. Although he seems to have worked with more than one photographer, the use of composition and lighting is always remarkably deliberate, and one suspects that he worked very closely with his cameramen to get the effect he wanted. No surprise that he was a production designer, because the sets are always carefully and artistically planned, and he gives actors and camera space to move around within the set as well. Finally, he was one of very few directors at the time who worked in three dimensions – what happens in the foreground and background can be more important than center stage, and performers move in all directions in his movies. 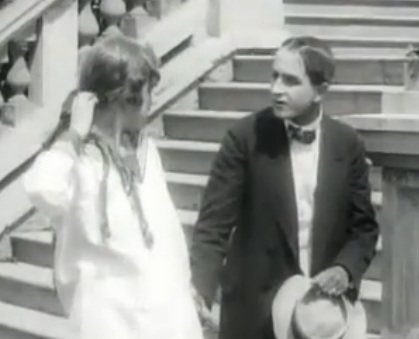 A still from Yevgeni Bauer’s 1917 film Za schastem with Lev Kuleshov and Tasya Borman. The one book I could find in English that provided any insight into Bauer was Silent Witnesses: Russian Films, 1908-1919. It’s a fairly rare book, I had to have my library order it from a University in Orange County, CA, and it’s rather odd as well. It’s dual-language, with English on the left side and Italian on the right, and sometimes the English reads is if translated by someone with only second-language skills. It refers to itself at several points as a “catalog,” and seems to have been intended to serve as companion to some kind of film festival or showing, in spite of its immensity (600+ pages). A lot of the text is apparently made up of comments from Russian film magazines, translated for current readers, with additional comments on each film by the editors. What I did get from this was an interesting view of the Russian film culture of the period. Judging by these magazines, there was quite a thriving film industry and film-going public in Russia at the time, one which seems to compare to the United States. Now, I have to imagine, given what I know of Russian society, that this would have been a largely urban phenomenon, and that it would have been restricted to population centers like Moscow and Petrograd, excluding much of the rural population and presumably the lower classes, who wouldn’t have money or leisure for something like movies most of the time. But, that may itself give us some insight. These journals take film very seriously: it is clearly regarded as an art form already, not just a cheap way to make money, as it often was in the US. The critics writing for these magazines had very high expectations of the literary and visual quality of the films they talked about. Presumably, Russian audiences had similarly high standards. In that sense, the emergence someone like Bauer begins to make sense. D.W. Griffith had to fight tooth and nail with Biograph in the United States to try to make anything “artistic.” He took too long, spent too much; all that was wanted was lots of content produced quickly so that the distributors could buy it up by the foot and fill up the nickelodeons with eager viewers. Bauer’s bosses at Khanzhonkov probably had a different approach (though I wouldn’t be surprised if there were arguments about budgets there too). They wanted to beat the competition in terms of producing works that would impress people that could be spending their time and money on live theater, and so were more willing to innovate to get an advantage. I don’t have numbers to prove it, but I’d bet there were fewer venues for film in Russia, so less reason to try to make lots and lots of movies, since a lot of them would have nowhere to be shown. They let Bauer work in longer formats, take more time with set ups and rehearsals, and in general they wanted to see quality at least as much as, if not more than, quantity, because that’s what they could sell. Bauer himself came from an artistic background. His father had been a famous zither player and composer, his sisters acted on stage, and he went to the Moscow School for Painting, Sculpture, and Architecture. No doubt it was there that he learned about composition and lighting, and he may well have brought painting techniques with him into film. After moving through several careers, he became a set designer, and was praised for the intricacy and style of his work. By the time he started making sets for the movies in 1912, he would have been forty five or forty six years old, was married, and had worked in various communications media, including the theater, newspapers, and magazines. He made 82 movies for Drankov, Pathé, and Khanzhonkov, had the highest salary of any Russian director, and became part-owner of the latter company through ownership of shares. He worked as a director only from 1913 to 1917, when he died due to pneumonia contracted after a fall while rehearsing walking with a limp for one of his movies. Now, back to those reviews for a moment. Considering how good his movies look today, I was surprised how harsh the criticism was, especially of my favorite Bauer so far, “After Death.” That one wasn’t about the film’s quality in itself, it was because he had dared to tamper with the sacred Ivan Turgenev, changing characters names and details for the movie. He actually wrote a sort of apology, admitting that “Turgenev should be approached in a different spirit and with different habits” than most film scenarios. Again, evidence of the high standards of Russian moviegoers! It’s hard for me not to speculate about what would have happened if he had survived into the Soviet period. Many of his actors continued in the Soviet silent period, and certainly good movies continued to be made, but I wonder about the politics of some of his films. He got his start in the business building sets for “The Tercentenary of the Rule of the House of Romanov,” not a subject the Bolsheviks would be likely to approve, though I note that its two directors continued working through the twenties. The portrayal of the proletarian in “Twilight of a Woman’s Soul” would also have been potentially embarrassing, certainly by the time of Stalin’s ascendency, but it’s possible that, had he lived, we’d have gotten a lot more great work from Evgeni Bauer. Of his movies, 26 supposedly remain, but for an American with limited resources, it’s hard to even see a dozen of them. The Wikipedia page for Bauer has links to watch seven of them, and I’d recommend them wholeheartedly to any fan of silent movies. *Of course, there are several ways of transcribing his name from Cyrillic. I’m opting for “Evgeni,” because that’s how it appears in “Mad Love: The Films of Evgeni Bauer,” the most accessible DVD collection of his work. Wikipedia prefers “Yevgeni,” and you’ll also find “Evgenii” and “Yevgenii” as well in other sources. Congratulations on your first blogathon post. I enjoyed reading it. I need to see more Bauer. Thanks for sharing with all of us. Thank you for your comment! I plan to return to him as well as this project continues. From what I’ve read, it seems like there may be a number of great Imperial-period Russian filmmakers to discover. Isn’t Bauer wonderful? I don’t understand why he doesn’t have a bigger profile, he is such a beautiful – and accessible! – filmmaker. Silent Witnesses is a great reference book. It was published in conjunction with Le Giornate del Cinema Muto, the silent film festival held annually in Pordenone, Italy, which presented a Bauer retrospective in 1989. The publication is specifically a catalogue of all the Russian production of 1908-1919 that is preserved by Gosfilmofond (the Russian national film archive). So there is nothing about films which are documented but don’t survive, or titles that may survive elsewhere. And yes, all of the excerpts are from contemporary journals, etc. Regarding the cultural context of films in the teens, I really recommend Denise J. Youngblood’s book The Magic Mirror. (I’ve written about that book here, if you’re interested). Thank you for the comment, the clarification, and the recommendation! I’m definitely with you on Bauer, I wasn’t expecting to stumble across anything so impressive in the early teens. I look forward to seeing what more I find as the project continues. Thanks so much for joining in and choosing my event as your first blogathon. I appreciated your insight into Bauer’s career. (I prefer Evgeni as well) What a strange, wonderful talent he was. I like to think he would have escaped with his colleagues and made it to France but we shall never know. So glad to meet a fellow Bauer fan. Many thanks for your comment, and thanks for hosting this event!